The 500ha EcoPark Satellite City Project that would construct around 20,000 residential units in Van Giang district close to urban Hanoi was approved by the government in 2004 and is currently among the largest urban development projects within Northern Vietnam. It was described by the proponents as the “perfect harmony of humans and nature”; however, this perception put forward by the urban elite, drastically clashes against the needs and development visions of the 4,000 families to be evicted, as the project is located on their agricultural lands, on which they base their livelihood. Consequently, the EcoPark has led to the most severe recent conflicts over land in Vietnam [1;2;3]. Since 2005, the company has tried to implement the project, but according to the villagers, the land was granted under illegal conditions that do not comply with the law, as there were neither proper consultation nor compensation processes [1;4]. Protests during 2006 have achieved a temporary suspension of the project, which however, was later on put back on the agenda . During the land confiscations and evictions conducted in 2009 and 2012, around 2000 households refused to take compensation, as, according to them, they were far too low [1;4]. Corruption likely has played a central role in worsening the conditions and allocation of adequate funds to the affected families . Periodic protests on site as well as in front of the government followed. When hired workers first arrived to clear the land, they clashed against the villagers, leading to several people injured . Particularly during April 2012, the conflict violently escalated, when during a police’s mass effort to evict villagers and to stop protesters with violence and tear gas, people defended themselves with throwing stones, bricks and Molotov cocktails ([3;4] and videos). Before the April 2012 evictions, that involved 5.8 ha of 166 families, as part of the development of 72.6ha during Phase 2 of the satellite city , farmers had set up camps to guard the area. 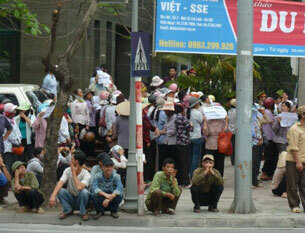 About 3,000 policemen and soldiers however arrived and went against 1,000 villagers. Several people were detained and had to remain in custody . 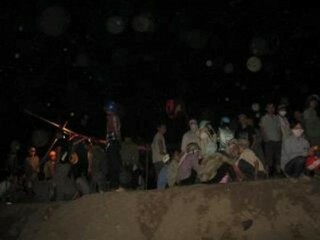 Journalists documenting the evictions were beaten by the police . 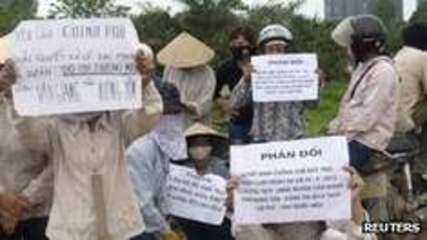 In the following, villagers filed complaints at the Van Giang people’s Court (May, 2012), which however were rejected and ignored, as according to the court there was a lack of evidence [4;7]. On February 10, 2014, the project developer allegedly sent armed men to prevent farmers from reclaiming their rice fields, set aside for the EcoPark. The armed men shot at several farmers, five of which were injured. Large protests followed, and further claims to fully investigate the shooting were voiced . In May 2014, EcoPark ironically won the Asia Pacific Property Awards due to its “careful planning and sustainable development strategy” . As of June 2015, the conflict goes on, being currently one of the most contentious land conflicts, in which small-farmers defend their land rights to make a living against an urban elite, profiting from luxury infrastructure projects. Project Details The EcoPark Satellite City Project was approved by former Deputy Prime Minister Nguyen Tan Dung in 2004 . 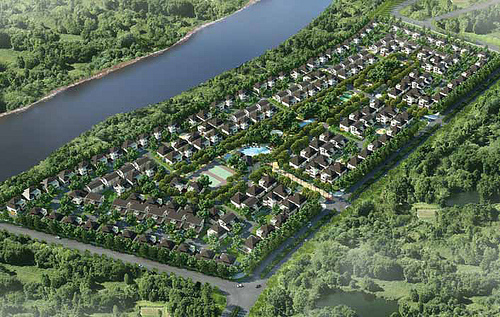 The purpose of the project is to create a large residential zone with around 20,000 residential units as well as luxury facilities such as a golf course, around 20 km Southeast of Hanoi, well-connected via urban transport. 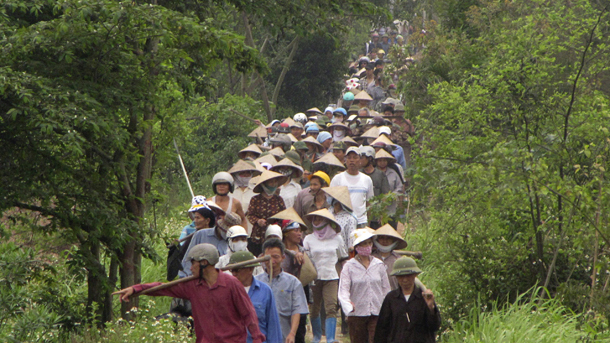 It is among the largest infrastructure projects in Northern Vietnam. Total project area amounts to 499.9ha and total investment size, required for its 9 phases of construction, was reported to amount to 8.2 billion USD . The Ecopark is developed by Viet Hung Urban Development and Investment J.S.C (VIHAJICO), a joint venture of the following Vietnamese Companies: AA Construction Architecture Joint Stock Company (AA Corporation); ATA Architects Co., Ltd; Nam Thanh Do Construction Consultants J.S.C; Thanh Nam Construction and Investment J.S.C; Duy Nghia Co., Ltd; Phung Thien Trading Co., Ltd; Nam Thanh Tourism and Commerce J.S.C; Bao Tin Trading Co., Ltd. . The contractor company for the first phase, the construction of the Rung Co Apartments, was Vietanmese CotecCons. First phase was completed in late 2011 . No information on the sources of loans and credits could be found. 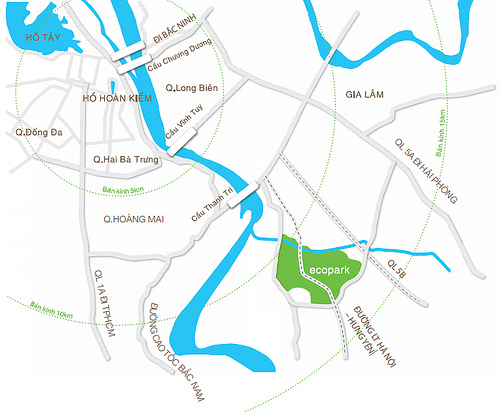 Vietcombank supports customers who want to buy apartments in the EcoPark with especially low interest rates . 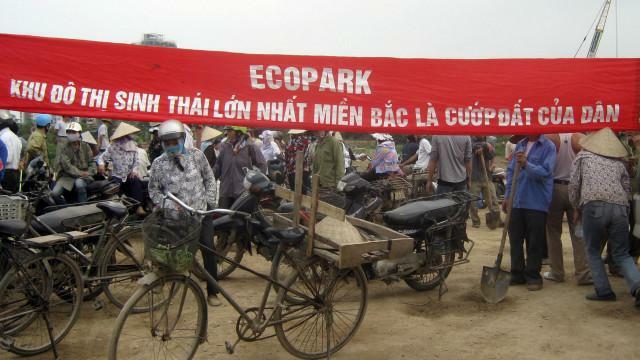 More than 4,000 families have to be evicted for the EcoPark Satellite City Project . According to newspaper reports, around 1,700$ were offered for each 360m2 plot, which according to villagers is inadequate . Development of Alternatives Affected families want cancellation of the project, or at least proper compensation.